Minecraft is a lot of different things to a lot of different people; a place to build a word processor, recreate Westeros or trap incredible monsters. For many players it's simply about survival, which means making sure you have shelter at night, forging armor and weapons with which you can fend off attackers, and somehow finding food to keep your hunger meter full. It's that last one that presented a problem for me when I picked the game up again recently. I decided to stop eating meat over a year ago, around the time I turned 25. My family has a history of heart disease, and the way I saw it my life was practically half over. I also really like animals—and not just dogs, although they're my favorites—and I got tired of killing them for their meat when I know full well there are ample alternatives in our modern society. I had to make a change. I started going to the gym, which hasn't worked out so well, and I stopped eating meat—which has. So now I'm a vegetarian, and I'm much happier. 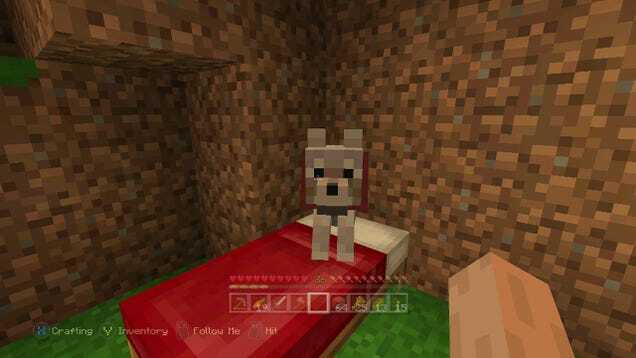 But when I started playing the Xbox One edition of Minecraft I found myself in a curious situation: how to play Minecraft successfully without killing any animals? When Minecraft arrived on Xbox 360 in 2011 my friends and I delighted for hours and hours in the game's splitscreen mode, crafting elaborate bases in which we squirreled away our valuables and set traps for one another. We experimented with redstone; I made a complex five-way track switcher—still one of my proudest gaming achievements—with help from a diagram online. We harassed one another constantly, but we played on “peaceful” difficulty so we wouldn't have to deal with destructive creepers and that pesky hunger meter too. I did occasionally crank up the difficulty, on Xbox 360 and again later when I built my first gaming PC. I'm not opposed to a challenge—the Souls games are some of my absolute favorites—and I wanted to feel that struggle. But the hunger thing vexed me, and I found myself spending way too much time hunting for pigs whose flesh I could roast for food. It was never long before the chicken drumsticks that represent your hunger started ticking down again, and farming seemed boring, so I eventually went back to peaceful mode and then lost interest in the game for a time. When the Xbox One version came out I upgraded without thinking, knowing I'd probably get back into it at some point. And my prediction became prophesy when my girlfriend's Minecraft-obsessed brother came to visit, his laptop in his bag and his pixelated pickaxe never far away. “Two can play that game,” I thought, meaning it literally. So I started it up and, knowing I'd quickly grow bored playing the same way I did three years ago, I selected “normal” difficulty. Daring, I know. I knew I could spend my time hunting pigs through the woods if I wanted to, but I wanted to see if I could play Minecraft as I live life: by doing as little harm as possible to my friendly animal neighbors. But I'm also not the first person who's had this thought. 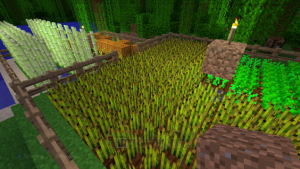 There are Minecraft Forum posts suggesting rules for a vegetarian challenge, and the same can be found on many other online communities. Some thoughtful players simply pose the question: “Do vegetarians avoid killing animals in-game?” One respondent says that any who do can't tell the difference between reality and fantasy, which I don't necessarily agree with. Imposing your own external rule set on a game is nothing new; it's called a metagame, and it's common in communities ranging from competitive first-person shooter players to avid Pokémon trainers. That's how I saw my own Minecraft vegetarian challenge: as an extra set of rules that I hoped would force me to play the game more creatively and, ultimately, have more fun. I had spawned and made my base in a jungle environment, so there were plenty of animals around. They proved a temptation—just until my crops started to grow!—but I resisted, instead abusing the game's generous save system. I did this a lot during those first few hours, making a bit of progress, getting killed by an errant mob or a careless step, and reloading to a few minutes earlier. That probably explains why I felt like the wheat wasn't growing, but sitting around waiting for it was like watching low-res paint dry, and I was determined to have fun. So just like in life, I eventually found a rhythm. The wheat did grow, and I quickly baked more bread than I could carry. I planted a mushroom farm in a dark corner of my mine so I could make stew. I eventually found a carrot on a zombie (I still don't really get why, but that's Minecraft) and I started multiplying those in the ground too. I added sugarcane to my farm so I could make cakes and cookies—you have to treat yourself sometimes—and I planted two rows of pumpkins, though you can't even eat them. I just like the way they look on my farm (update: apparently I can make pumpkin pie! Yay! Thanks commenters). I do object on some level to the hunger meter being represented by those flesh popsicles, which look less appetizing to me with every day I spend not indulging in them. If I was on PC I could probably mod those out, but oh well. I'm on the right track, and I'm not going to start over now. Every time I pick Minecraft back up I discover something new that I love about it. I think that's one of the reasons why it's remained so popular for so long: there's always more to discover. And I've still barely mined the surface. I'm building a picturesque home block-by-block, and I have a minecart track with some simple redstone mechanisms to take me between my farm and house and mines. But I've never brewed a potion, or traded with a villager, or defeated the Ender Dragon or the Elder Guardian (or even seen them, for that matter). I'm excited to keep playing and discover everything that's been added since the last time I was into Minecraft, and there are definitely lots of unknowns. But one thing I am certain of is that I'll never again find myself chasing a pig through the woods with a sword in Minecraft.